CHICAGO, Aug. 19, 2015 /PRNewswire/ — A new study revealed that your cereal choice at breakfast might have an impact on how much you eat for lunch. Newly published research in the Journal of the American College of Nutrition showed that a hearty bowl of instant oatmeal helped curb food intake at lunch better than a leading oat-based, cold cereal — even when each bowl provided the same number of calories. The statistically significant results of the randomized, controlled crossover study (n=47) showed that a 250-calorie instant oatmeal serving (with an additional 113 calories of skim milk) enhanced satiety and feelings of fullness, reduced the desire to eat and may even lead to a lower caloric intake at lunch, compared to a 250-calorie serving of cold, oat-based cereal, also served with an additional 113 calories of skim milk. After an analysis of the types of fiber in each cereal, the researchers suspected that the higher molecular viscosity of the beta-glucan in the instant oatmeal contributed to its satiating effect over the oat-based, cold cereal. Authors stated that the processing of the cold cereal might lead to changes in the oat fiber that reduced its ability to enhance satiety. Researchers presented the participants with a lunch meal of their choice – turkey, ham, roast beef or vegetable patty sandwiches and a calorie-free or calorie-containing beverage, alongside potato crisps and cookies. The lunches offered ranged from 2,600 to 2,800 calories and participants were told to “eat to satisfaction.” Total calorie intake was significantly lower following consumption of instant oatmeal compared to the cold cereal, as were fat and protein intake. Grams of carbohydrate and total weight of the foods were not significantly different. The Quaker Oats Center of Excellence is focused on elevating the relevance and benefits of oats through science, agriculture and innovation. For more information, visit the Quaker Oats Center of Excellence at www.QuakerOats.com. The Quaker Oats Company, headquartered in Chicago, is a unit of PepsiCo, Inc., one of the world’s largest consumer packaged goods companies. For more than 130 years, Quaker’s brands have served as symbols of quality, great taste and nutrition. 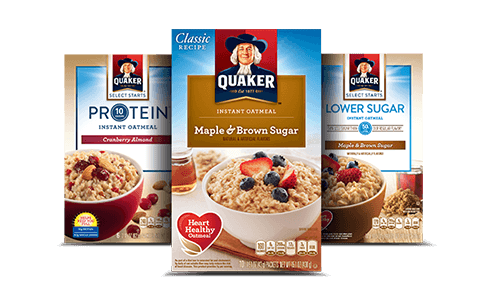 Holding leadership positions in their respective categories, Quaker® Oats, Quaker® Rice Cakes and Quaker Chewy® Granola Bars are consumer favorites. For more information, please visit www.QuakerOats.com, www.Facebook.com/Quaker or follow us on Twitter@Quaker.